This finished dish never lasts more than two days in our house. It’s that tasty. It’s hard to even put it in the fridge, you just want more. 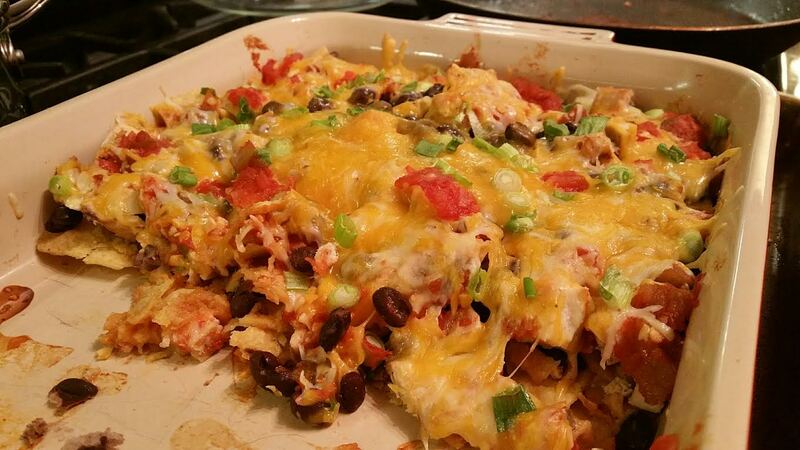 It’s a perfect meal: protein of the beans and chicken, carb of the tortilla chips, fat of the cheese (and optional sour cream), and veggies: salsa, green onion, and beans (which have fiber too). It’s just perfect, believe me. You can health it up by doing multigrain or high fiber tortilla chips. —–I put some ground cumin on my raw chicken, pan-fried it with some olive oil (via the Misto), let it rest 5 mins, then I chopped it into bite-sized pieces. I am not often a fan of shredding, it takes forever. —–I used organic low sodium black beans. If you only have regular black beans, drain and rinse them multiple times – it removes 40% of the salt! If you do not already have your chicken cooked and ready, cook it now. Let it rest a few minutes before chopping or shredding. Line bottom of a 13x9x2″ baking dish with tortilla chips. Scatter cooked chicken and beans over the chips. Spoon salsa over the beans and top with cheese and scallions (or green onions). Bake at 350 for 15 mins. until heated through and cheese is melted. I saw this recipe in my newest magazine subscription – Cooking Light. “This quick five-ingredient entree transforms a favorite pizza combo into a melty grilled sandwich. To thinly slice fresh mozzarella with ease, freeze the cheese for about 30 minutes before cutting.”. 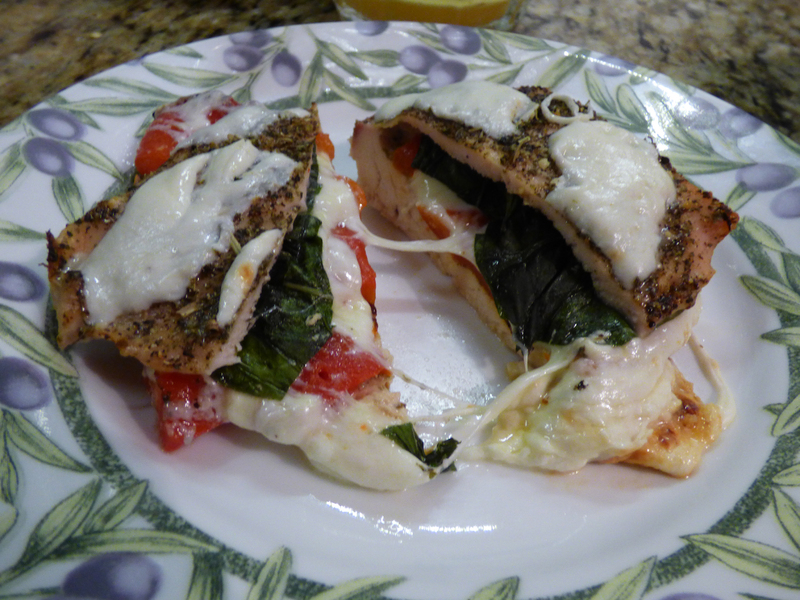 We all know Margherita pizza is just a culinary delight, so this sandwich is wonderful. Next time I will, a) use the panini press, b) I think the recipe forgot to say to seed your tomatoes, a very important step to avoid a soggy sandwich. Spread 1 tablespoon marinara over 1 side of each of 4 bread slices. Top evenly with cheese and tomatoes. Sprinkle tomatoes evenly with pepper and salt. Top tomatoes with basil and remaining bread slices. Lightly coat sandwiches with cooking spray. Heat a large skillet over medium-low heat. Add 1 1/2 teaspoons oil to pan, swirl to coat. Add sandwiches to pan, cook 2 1/2 minutes or until browned. Brush tops evenly with remaining 1 1/2 tsp. olive oil. Turn sandwiches over, cook 2 minutes or until browned. In a large bowl, whisk together the garlic, hoisin sauce, rice wine vinegar, sesame oil, five-spice powder, cayenne, salt, and chopped green onions, if using. Add the wings to the mixture and use your hands to toss and coat the wings with the marinade. Let stand at room temperature for 10 to 15 minutes to marinate. Line a large baking pan with aluminum foil. I double lined it for drip security. Remove the wings from the marinade, shaking off the excess and saving marinade for basting. Arrange the wings in a single layer on the baking pan. 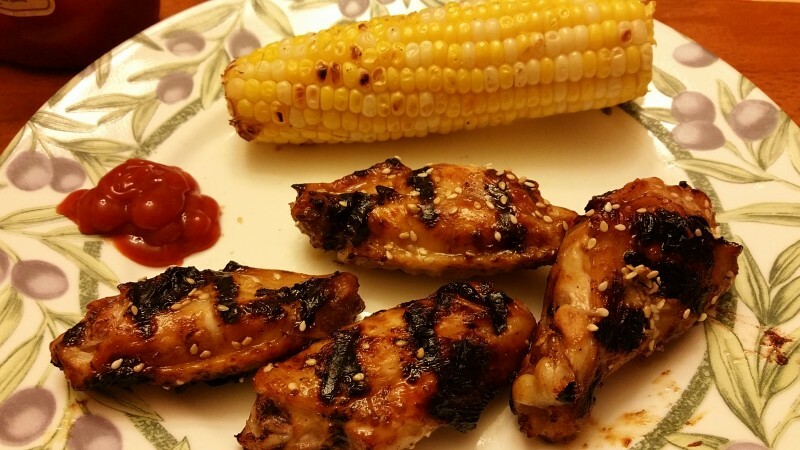 Remove from oven and baste the wings with the leftover marinade, and sprinkle the sesame seeds, if using, over the wings. Transfer to a platter and serve. Sprinkle with chopped green onions for decoration, if desired. I had the pleasure of spending time with my sister-in-law and her daughter and baking this recipe with them. It was pretty straight-forward and easy, as far as baking goes! Her new mixer came in handy. 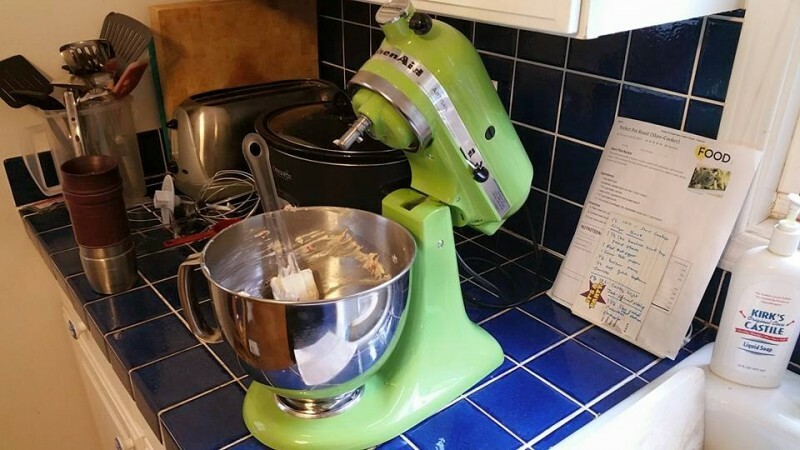 I have owned the same Kitchenaid Artisan mixer for years and it is very easy to use. Two controls: one side is the lock, the other is the speed. Easy and makes light work of something like kneading bread dough or whipping cheesecake batter that must be fully mixed or else. Also, it’s a star at creaming butter and sugar. 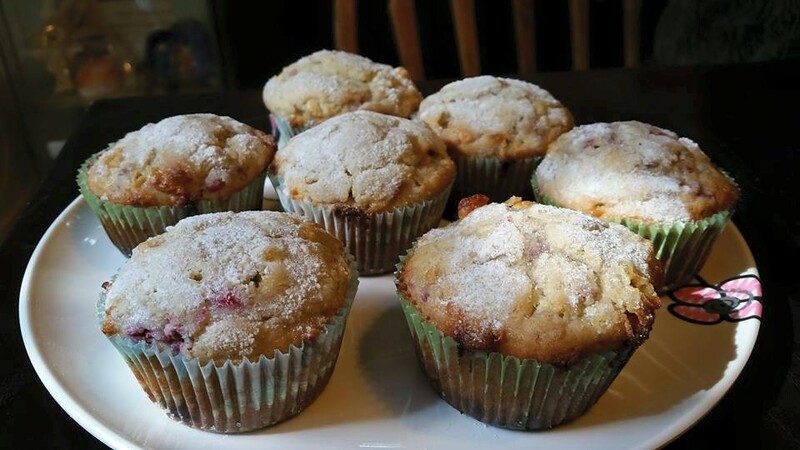 This recipe yielded approximately 12 servings, but for us, it yielded about 15 muffins. **White chocolate and raspberries can irritate some IC patients, so please be careful. Grease 12 standard-size muffin cups, or line with paper muffin liners. In a medium bowl, using an electric mixer on medium speed, cream together the butter and sugar until smooth. Add the egg, milk, and vanilla; blend well. In a separate large bowl, combine the baking powder, 2 cups of the flour, and the chopped white chocolate; whisk to combine. Gradually add to the butter mixture; stirring just until combined. 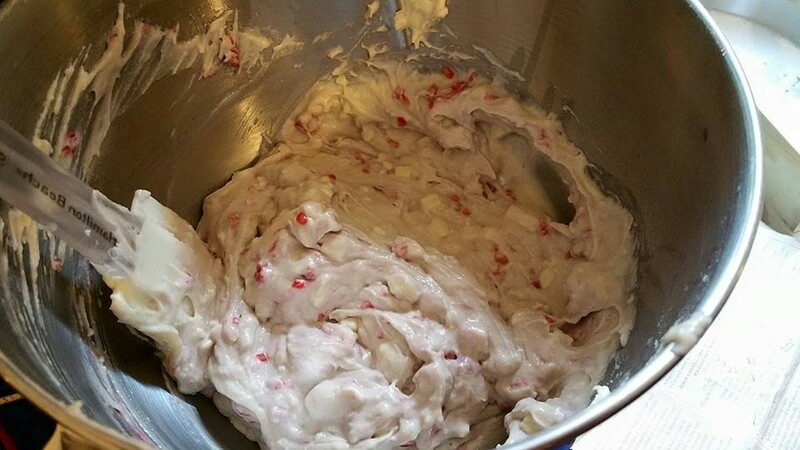 Gently fold in the raspberries–the batter will be slightly lumpy. (The original directions on the Ghirardelli wrapper did not say to gently fold in, so we mixed them in which crushed them. Either way, it will turn out just fine, it depends on your preference). Fill the muffin cups 3/4 full of batter. In a small bowl, combine the 1 Tbsp. of flour and 1 Tbsp. sugar; mix thoroughly. Dust muffin tops with the sugar mixture. Bake for 20-25 minutes, or until the center of a muffin springs back when lightly pressed. Cool for 5 minutes in the tins; carefully transfer muffins to wire racks and cool further. Serve warm or cool; store in an airtight container at room temperature.